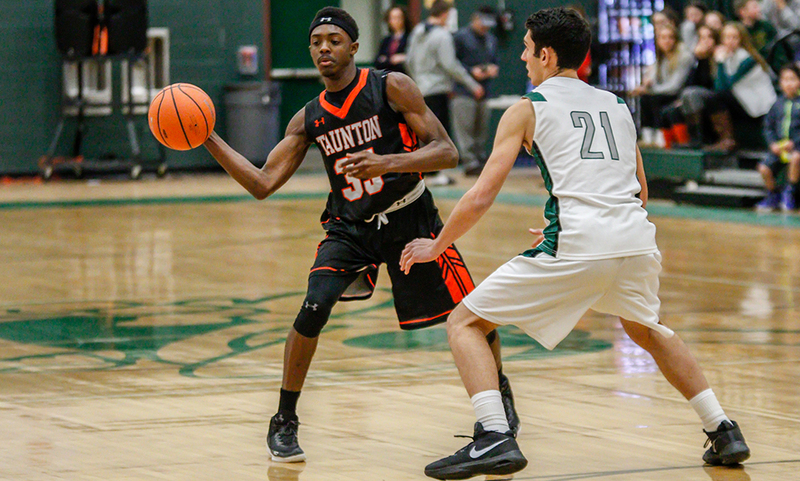 #1 Mansfield, 76 vs. #16 Newton South, 49 – Final – Mansfield junior Damani Scott poured in a career-high 25 points, going a perfect 5-for-5 from three-point range to lead the Hornets to an opening-round win over Newton South. Mansfield led 13-9 after the first quarter but scored 44 points over the second and third quarters, limiting the Lions to just 21 in that same span. Tyler Boulter added 14 points, four rebounds and three assists and Justin Vine finished with 13 points. Mansfield will host #8 BC High, just one of two teams that beat the Hornets this year, on Friday at 6:30. #14 Attleboro, 48 @ #3 Brockton, 71 – Final – Click here for a recap of this game. #15 Taunton, 53 @ #2 Needham, 66 – Final – Taunton opened the fourth quarter with an 8-2 run over the first 2:32 to get within one possession (49-46) but never got closer. The Tigers were within seven (55-48) with 3:30 to play but the second-seeded Rockets finished with an 11-5 run. Senior Malik Charles led the Tigers with 13 points while classmate Lens Esquil added 12 points. #1 Foxboro, 64 vs. #16 Milton, 30 – Final – Foxboro senior Ashley Sampson scored 24 points to pace the top-seeded Warriors to a big win in its playoff opener. Foxboro will host #8 Stoughton on Friday at 6:30. #9 Mansfield, 2 vs. #8 Xaverian, 6 – Final – Click here for a recap of this game. #10 Oliver Ames, 2 vs. #7 Westwood, 3 – Final (OT) – – Click here for a recap of this game. #21 Mansfield/Oliver Ames, 3 @ #12 Plymouth, 0 – Final – MOA freshman Alex Ledin scored the game-winner goal just over six minutes into the third period and the Warriors tacked on a pair of empty-net goals to earn the first postseason win in program history. Mackenzi Fraser and Cat Luciano scored empty netters to ice the win. Freshman Cate Gallagher recorded the shutout in net. #21 Mansfield/Oliver Ames will play #5 Barnstable on Sunday at 6:00 at Kennedy Rink. #14 King Philip, 2 vs. #19 Bishop Fenwick, 1 – Final – Senior Talia Quinn opened the scoring in the first period and senior Olivia McCarthy scored the game-winner early in the third period to lift King Philip to its first ever postseason win in program history. #14 King Philip will take on #3 Archbishop Williams (14-4-2) on Saturday at 3:00 at Zapustas Rink in Randolph. BOSTON, Mass. – Playing on the legendary parquet floor at the TD Garden can certainly be overwhelming; the lights are brighter, the music is louder, there’s a Jumbotron, thousands of more seats, and not to mention a long list of Hall of Famers that have played on the same floor. But Mansfield head coach Mike Vaughan is essentially a veteran when it comes to games at the TD Garden, between playoff appearances and previous appearances in the Good Sports Invitation. Mansfield took the message in stride, racing out to a 9-0 lead, a 24-9 advantage after the first quarter, and led by as much as 20 (33-13) in the first half in a convincing 73-53 win over Cardinal Spellman. Tyler Boulter (five points, eight rebounds) opened the scoring, Justin Vine (10 points, five rebounds) followed with a layup, John McCoy (20 points, nine rebounds) followed with a strong take to the basket, and Vine splashed in a triple for a quick 9-0 lead just three minutes into the game. A three from Boulter extended Mansfield’s lead to double digits (14-4) and Mansfield finished with a 10-5 run the rest of the quarter, including four straight from Sam Hyland (10 points, seven rebounds), a pair of putbacks from McCoy and a pull up jumper from Khristian Conner. A traditional three-point play from McCoy gave the Hornets their largest lead at 33-13 at the midway point of the second quarter, but the Cardinals finally came to life. Spellman finished the half with a 13-5 run, limiting Mansfield to just two field goals in the final four minutes. The run kept the Cardinals within striking distance, 36-26, at the halftime break. Mansfield made sure the run didn’t continue into the second half as both Vine and McCoy hit threes to keep the Hornets lead in double-digits. When Spellman cut the deficit down to 14, McCoy hit a layup, Hyland drove for two, and then Hyland converted a breakaway after Scott tipped away a pass. 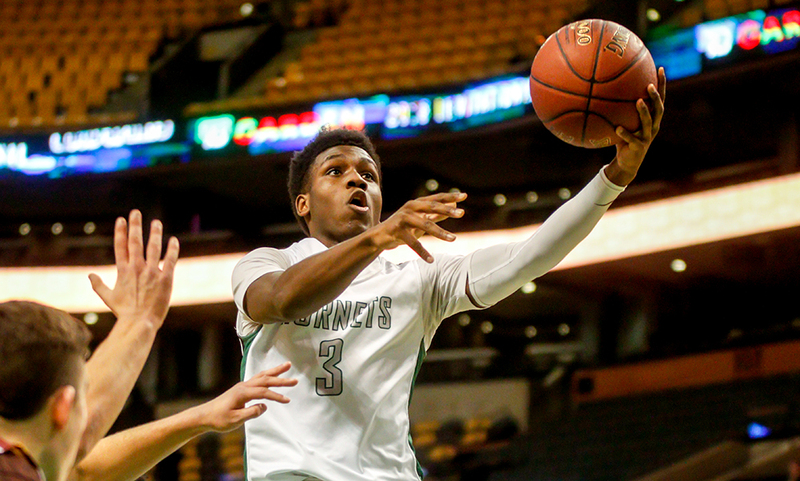 Junior Damani Scott scored 11 of his 13 points in the second half to help keep the Hornets in front. Leading by 15 heading into the final period, the Hornets never let the game get close and outscored the Cardinals 19-14 in the final frame. Mansfield boys basketball (9-1 Hockomock, 13-2 overall) returns to action on Tuesday when it entertains Milford. The Hornets’ players are hoping to return to the TD Garden later on in the season with a deep playoff run. “That’s one of our goals is to get back here in the state tournament,” McCoy said. “We definitely want to be back here for a game that means even more,” Hyland added. Attleboro, 71 @ Oliver Ames, 57 – Final – Click here for a recap of this game. 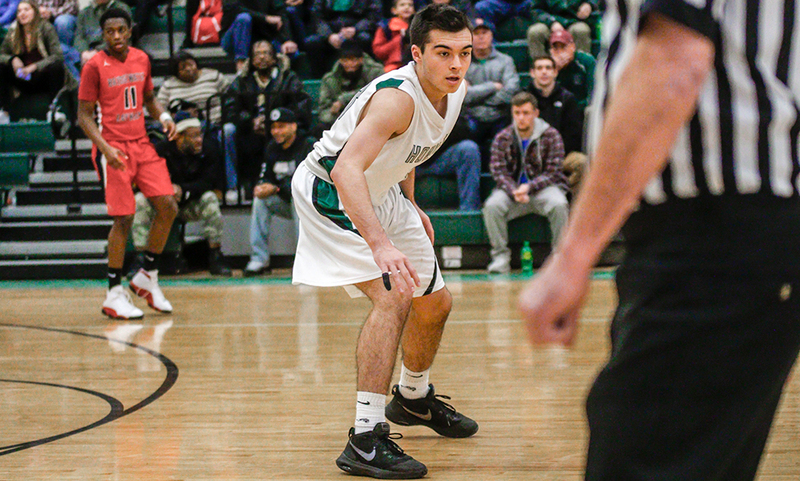 Mansfield, 72 vs. Hanover, 44 – Final – Mansfield senior Tyler Boulter connected on five three-pointers, scoring a season-high 17 points to lead the Hornets over the defending D3 state champions in an endowment game. Senior Sam Hyland added 13 points, four rebounds and four assists while both Damani Scott and Justin Vine had 10 points apiece. Mansfield, 45 vs. St. Anthony’s, 56 – Final – Meg Hill had her second double-double of the weekend to lead the Hornets. Hill finished with 15 points, 12 rebounds, and five blocks. Maggie Danehy just missed out on a double-double of her own, scoring 13 points and pulling down nine boards. Mady Bendanillo had eight points, five assists, and four steals against strong competition from New York. Sharon, 55 vs. Holliston, 56 – Final (OT) – Click here for a Recap and Photo Gallery from this game. MANSFIELD, Mass. – After suffering its first loss of the season, Mansfield had a chance to right the ship before it began division play in the new calendar year. 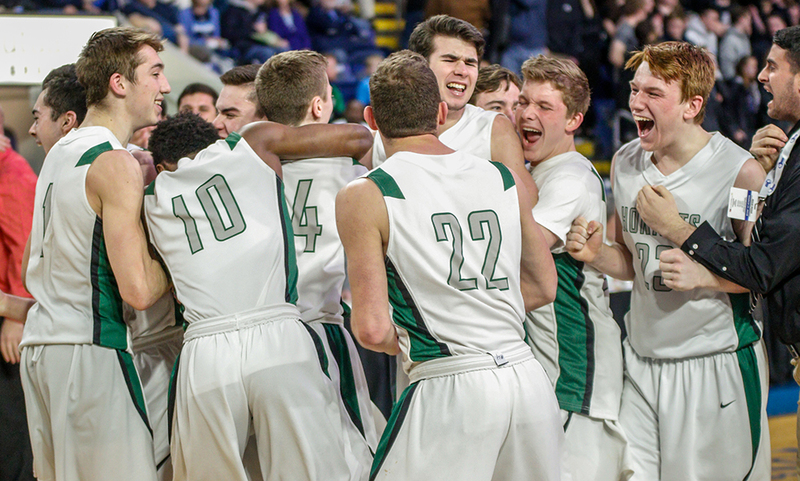 In a rematch of last year’s D1 South Sectional semifinal, Mansfield did just that. 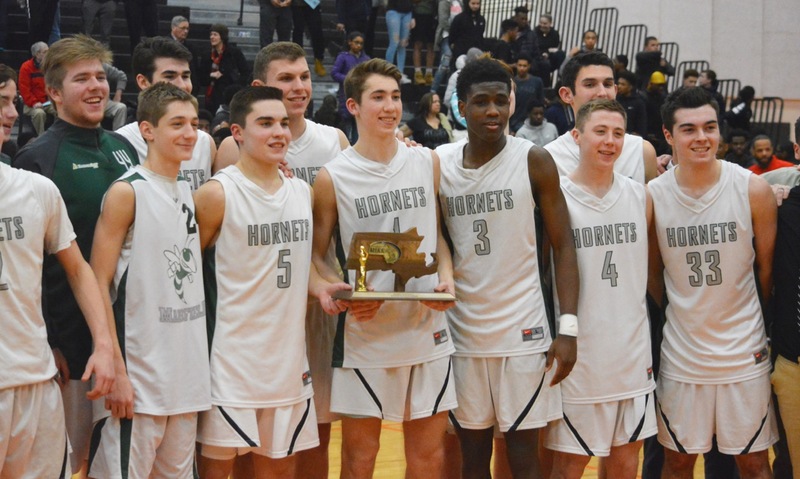 The Hornets built an early lead and never looked back, capping 2017 with a 60-47 win over Bridgewater-Raynham. “It’s huge,” said Mansfield head coach Mike Vaughan. “B-R has become one of the top teams in D1 South, we know we could potentially see them again in March. Mansfield created the necessary separation in the first quarter, outscoring the Trojans 16-6. The Hornets scored two more points than B-R in each the second (18-16) and third (12-10) quarters to stay ahead. While seniors John McCoy (22 points and 11 rebounds) and Justin Vine (career-high 21 points) propelled the Hornets with their scoring, Sam Hyland had a terrific all-around game with nine points, 11 rebounds, six assists and four steals to highlight terrific defensive performance. Hyland also helped limit Bridgewater-Raynham’s top scorer, senior Doug Alves, to just five points on 1-for-9 shooting. Alves picked up two early fouls that kept him out for the final six minutes of the first quarter but was held in check by Hyland the rest of the game. “He’s our go-to guy [defensively] for guards,” Vaughan said. “He doesn’t foul a lot, he doesn’t do stupid things, he doesn’t gamble, he just makes it very difficult [for opponents]. Tonight I thought he did a really good job on Alves and made it difficult for him. Alves got two fouls early unfortunately which probably took him out of his rhythm but Sam did a nice job. Hyland helped restore Mansfield’s 14 point lead at the end of the third quarter, coming up with a steal and an easy layup. After B-R drained a three to open the fourth quarter, Hyland came right back down the other way and converted a traditional three-point play to prevent the Trojans’ from rattling off an early run in the quarter. McCoy was the catalyst for the Hornets in their best quarter. The senior scored nine of his 22 points in the opening frame. 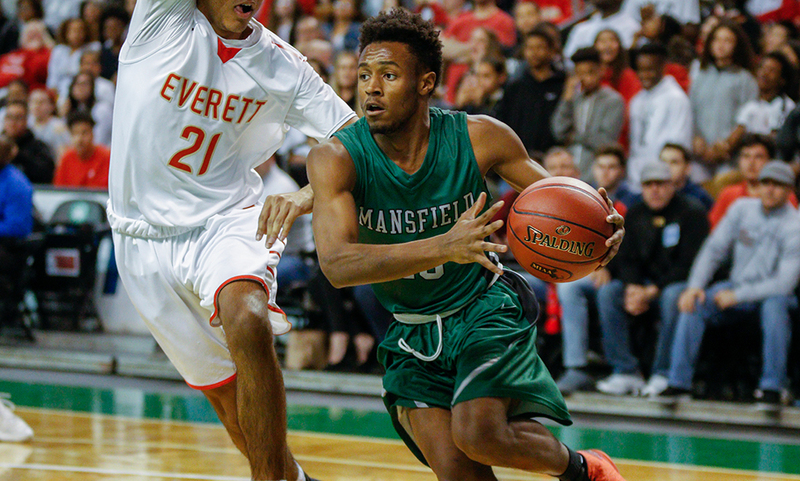 McCoy’s back-to-back layups put Mansfield up 6-2; he then scored the Hornets’ final five points of the quarter, including a three in the final minute, to create the double-digit lead. In the second quarter, the Trojans put together their best stretch of the game — an 11-2 run — but that only brought B-R within nine. That’s because Mansfield opened the second quarter with an 8-0 burst of its own. Vine, who started his first game for Mansfield, sandwiched a pair of triples around a layup from McCoy to put the Hornets up 24-6. When Bridgewater-Raynham made its run, cutting it to 26-17, Vine drew a foul while shooting a three. He hit two free throws to halt the run, and then canceled a triple from B-R’s Connor Rubenskas with a trey of his own. Senior Ryan Otto added seven points and seven rebounds for the Hornets, who won the battle on the boards 38-30. Mansfield boys basketball (3-0 Hockomock, 5-1 overall) begins the 2018 calendar with a tough test, opening division play at home against Taunton (2-1, 5-1) on Friday, January 5th.